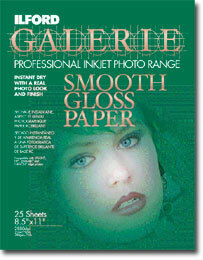 Smooth Gloss Photo Paper, 25shts, 13x19"
*As with all microceramic (instant dry) coated media, ILFORD GALERIE Smooth Gloss can be susceptible to 'gas fading' due to air bourne pollutants. Covering the image with glass for example, will ensure that a print from a dye based printer will last for up to 10 years depending on the manufacturers ink. Initial accelerated testing indicates that a GALERIE Smooth Paper product will last in excess of 30 years using a pigment ink desktop printer.